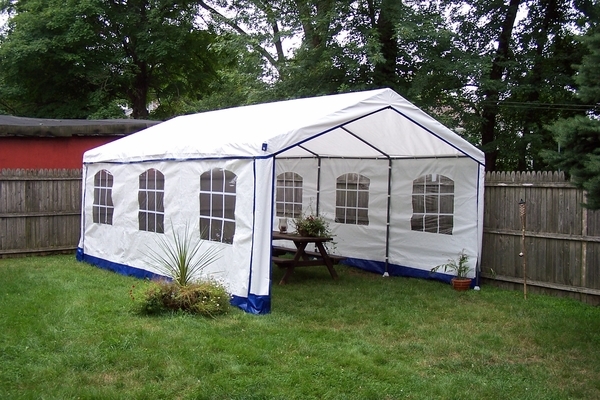 No matter what the occasion, the Rhino Shelter Decorative Backyard Party Tent can bring it outside,birthday party, garage sale, cookout; you are covered. The 14 x 20 x 9 tent comes with a steel frame and polyethylene fabric with heat-welded seam construction for durability; the tent is fire retardant and UV protected. The removable side walls feature windows for a more spacious feel, and the zippered doors can be tied back for more air flow. Because the frame pieces are pre-drilled and pre-cut, set-up is a breeze; Velcro and bungee cord fasteners make it even easier. So start filling out the invitations.